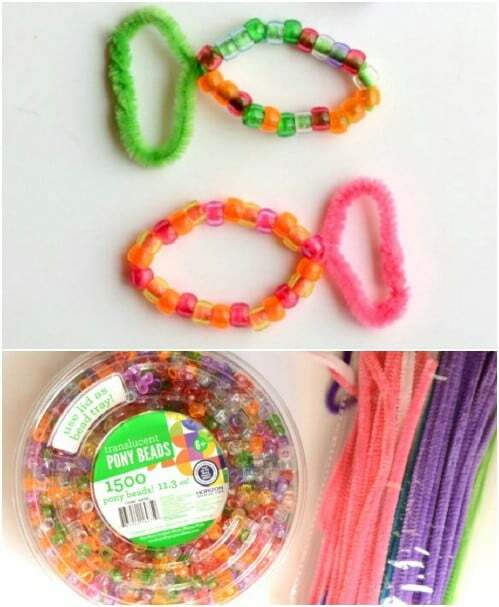 Bead crafts are so much fun for kids and adults. If you love bead crafts, I have just the craft project list for you. 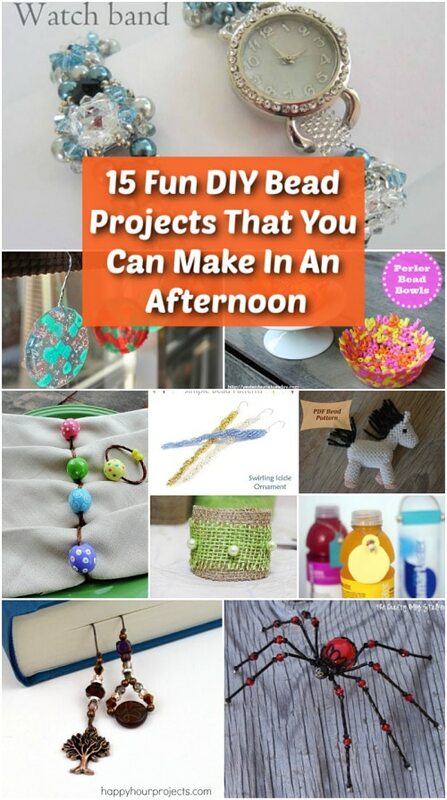 I want to share my favorite 15 fun DIY bead projects that you can make in an afternoon. Most of these will take you less than an hour to complete and all of them are so much fun to make. Many of them are great for kids, too, and the projects range from wooden to plastic beads so there is something for you no matter what type of beads you may have on hand. From great DIY suncatchers to beaded animals, jewelry and even kitchen and dining room essentials, you will definitely find something that will let you put those beads to good use. There are projects in here that are great for teenagers and all of these would make wonderful gifts for someone special. If you love bead crafts then I promise that you are going to find a wonderful project to spend an hour or so on. And, be sure that you also take a look at my 17 easy to build DIY craft desks. They will make all of your crafting so much easier. Bead crafts are great for kids when they can’t get outside to play or just need something to stimulate their creative side. These crafts are all pretty simple and all of them can be done by children with adult supervision. Some of them can be done by the kiddos completely on their own. If you want a project for your stash of beads – or even if you have to buy the beads – you are going to love these. There is something in here for everyone in the family! You know what else offers something for everyone? My 30 top DIY summer sewing projects. There is something for everyone in the family and every room in the house! These plastic bead suncatchers are such a traditional craft. I remember doing these at summer camp when I was a kid and the process really hasn’t changed much. To make these, you just need a collection of plastic beads and a disposable muffin tin. You can mix and match colors to create such unique suncatchers. This is a great project for the kids and even toddlers can help to create their own designs. I found the most adorable pattern on Etsy to make these little beaded animals. 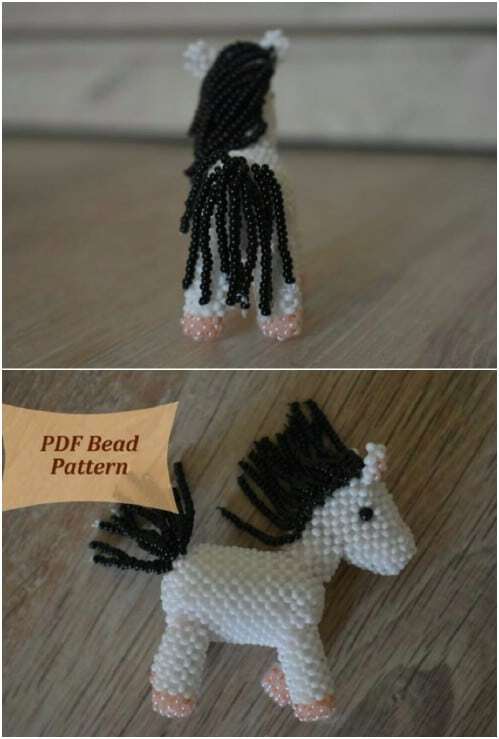 You can get the pattern for a horse for around $5, and there are tons of other animals available. You just need beads to make this and some imagination if you aren’t going to follow a pattern. These would be really cute for birthday or baby shower gifts for little ones to display in their bedrooms and they’re pretty easy to make. 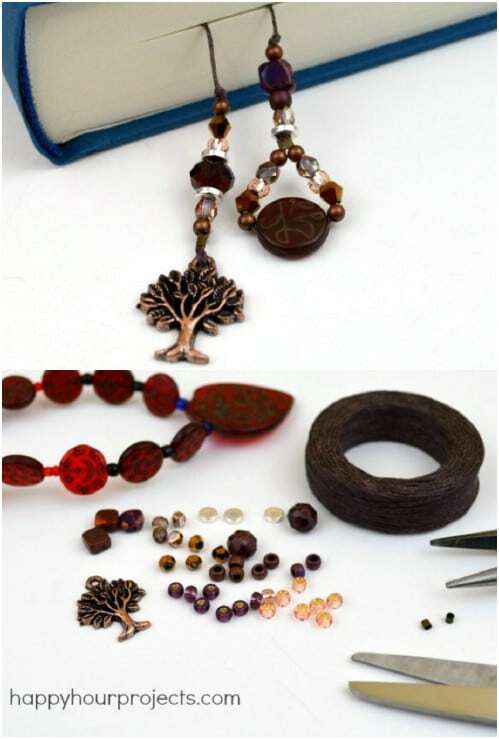 You can make a beautiful bookmark with a few wooden or plastic beads and some linen twine. These are super easy to make and so gorgeous when they are finished. They would make wonderful gifts for any bookworm that you know and you can completely customize them depending on the number, size and type of beads that you use. These would also make lovely necklaces if you just increase the length of your twine. I really love rustic twine projects. 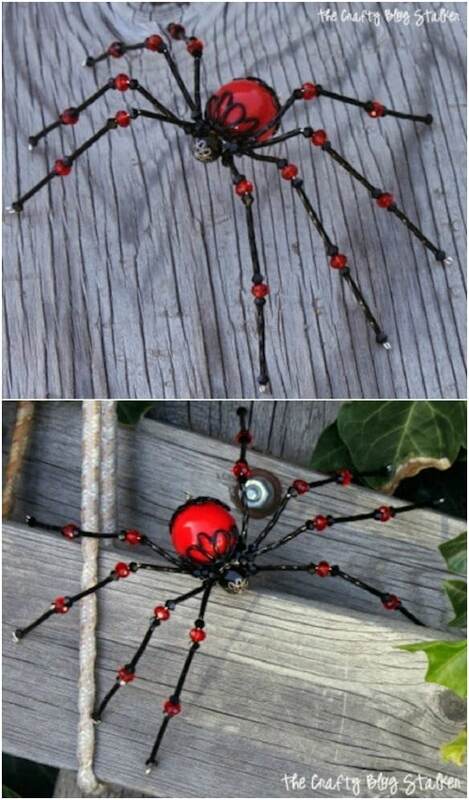 I am not at all a fan of spiders, unless it’s these cute little beaded spiders. These would make the most adorable Halloween decorations and you could use them in so many ways. Add them to your DIY Halloween wreath or just hang them from fishing line on the porch or all over the house. The possibilities with this one are endless and you just won’t believe how easy these DIY beaded Halloween decorations are to make. 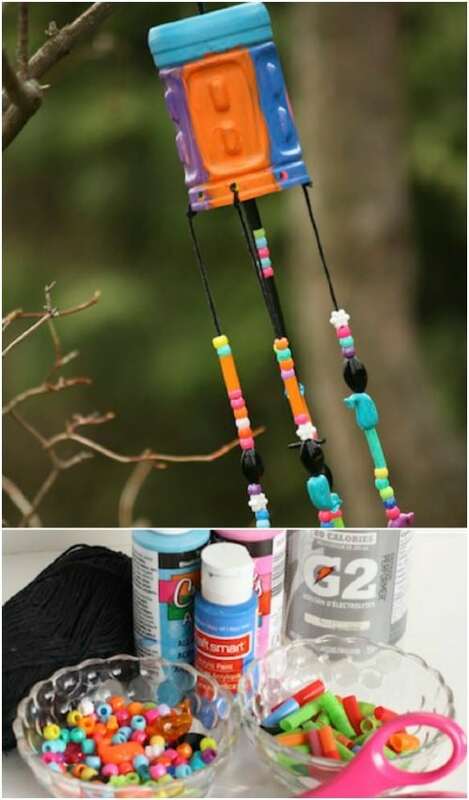 You can turn an old bottle, an old coffee container or just about anything else into a great windchime by adding a few beads. These DIY windchimes are so easy to make and this is a wonderful project for the kids. Even your toddlers can help to choose the design that they want and add beads to string to make the windchime. These are great for hanging on the porch or in the garden and they’re a great way to upcycle some household containers. 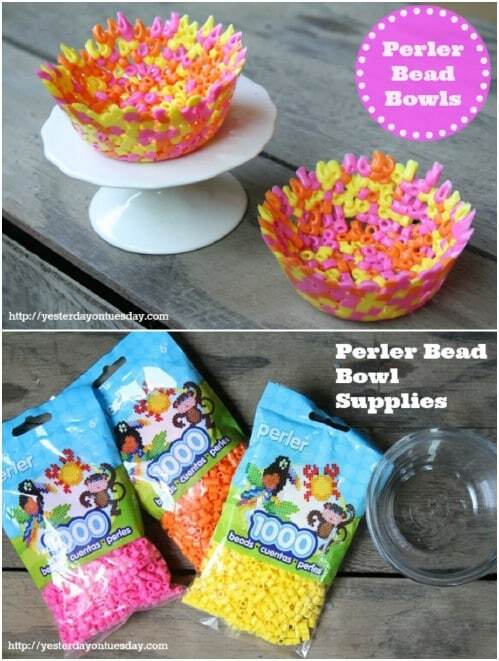 Your little ones can make this great beaded bowl almost all by themselves, depending on their ages. These are made with meltable plastic beads and they are perfect for holding jewelry or other trinkets. This is also a really quick and simple project for kids to do and it gives them an amazing bowl to hold whatever they want. Plus, they can choose their own designs and colors to customize them. 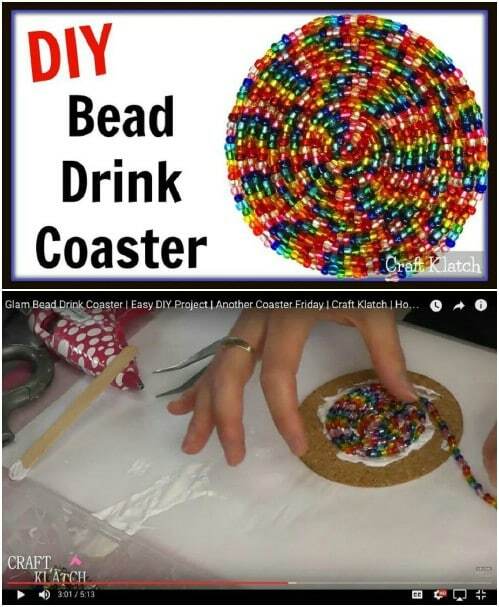 You could make these DIY beaded coasters in a couple of ways. You could take the time to glue each bead into place or use strings of beads, which makes it much faster and easier. You can buy beads in strings or if you have a collection of beads that you want to use, you could also string them up on fishing line or elastic string to create this same look. 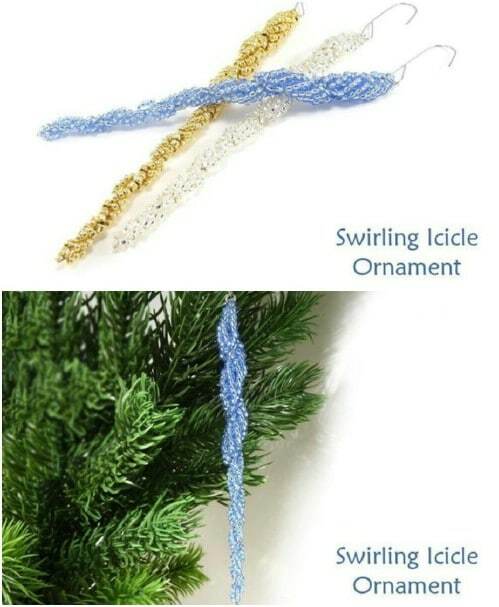 Etsy has a pattern for these gorgeous swirling bead icicle ornaments. You can use beads of any color to match your existing Christmas decorations or just do these in white or clear for a more traditional icicle look. They’re super easy to make once you have a pattern and the beads to make them are really cheap. You can grab the pattern on Etsy for under $5 and make plenty of these gorgeous ornaments before the holidays arrive. If you have a bit of burlap that is leftover from other projects, and a few beads, you can make these lovely rustic burlap and bead napkin rings. These are perfect for decorating your farmhouse table and they take only minutes each to make. You can use pearls or choose wooden beads or any other beads that you have on hand. 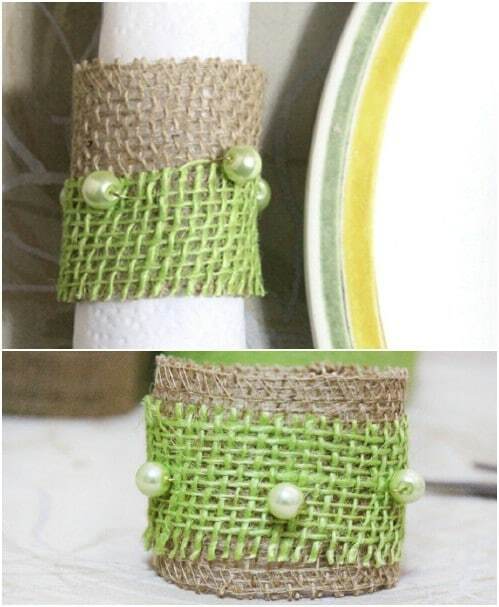 If you love DIY burlap projects, you are going to adore these napkin rings. Kids are going to love making these little fish from pony beads and pipe cleaners. This is such a fun craft and it lets your little ones create their own fish designs. Kids have been making crafts with pipe cleaners and beads for decades and these little fish are perfect for when you need something for the kids to do. If it’s raining out or they’re just really bored, this is the perfect little kids’ craft. 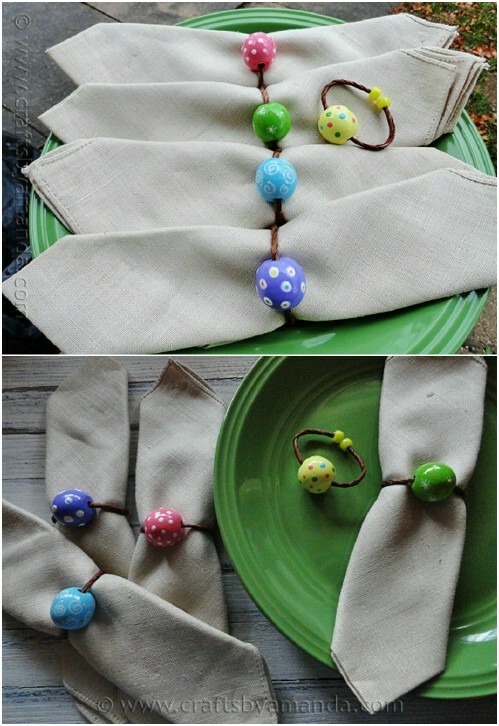 Here is a great little DIY napkin ring that you can make from wooden beads and twine. You could also use plastic or glass beads if that’s what you have on hand. These are super easy to make and so attractive when they are finished. You can use twine, hemp or jewelry wire to make these and they are super easy to customize. 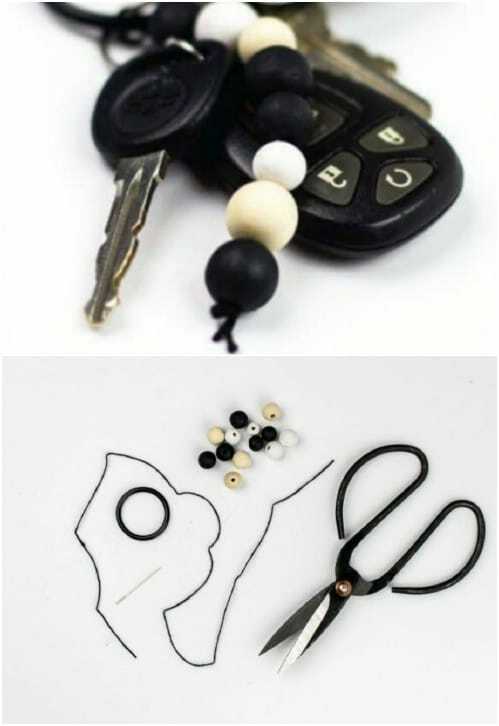 This little bead keychain is super easy to make and it’s a great little addition to your keyring. You just need some wooden, plastic or glass beads and something to tie them on to make this. You can make these in less than five minutes each and add as few or as many beads as you want to customize each one. You could also do these with decorative beads or spell out names. This DIY toy is amazing and kids are going to love it. 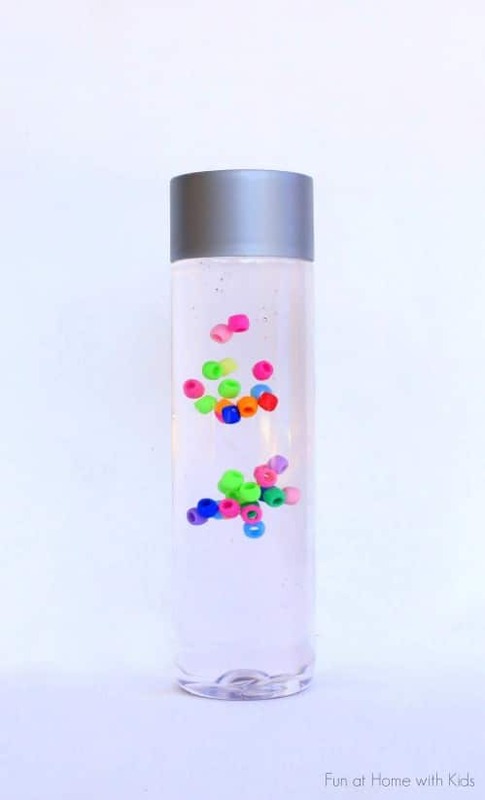 It’s a bottle that has suspended beads and it’s great if you love DIY sensory toys for your kids. You make it with a plastic bottle, soap, plastic beads and glue. This is a wonderful discovery toy for sensory play. Kids can watch the beds move slowly through the soap solution and you can add as few or as many beads as you want. 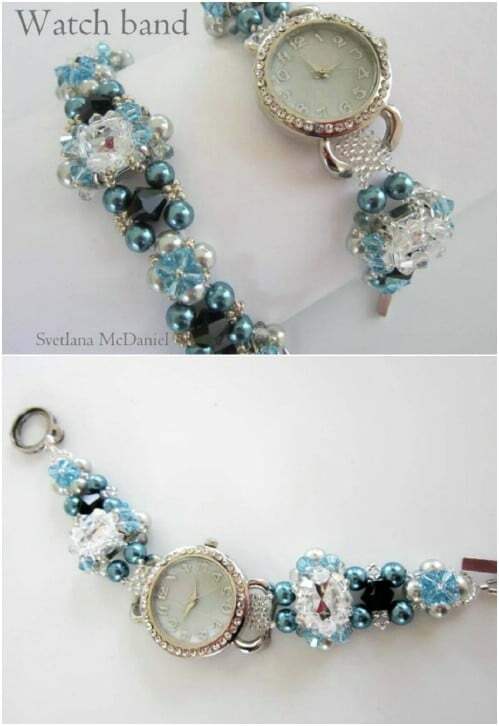 I love this little watch that has a bracelet made of beads. This would be so easy to make, even if you don’t have a lot of experience with DIY jewelry making. I found the pattern for this on Etsy and it’s less than $3. It gives you all of the details and instructions for making this lovely watch, including a list of what you need to make it. You know when you’re at the gym and you accidentally pick up someone else’s water bottle? 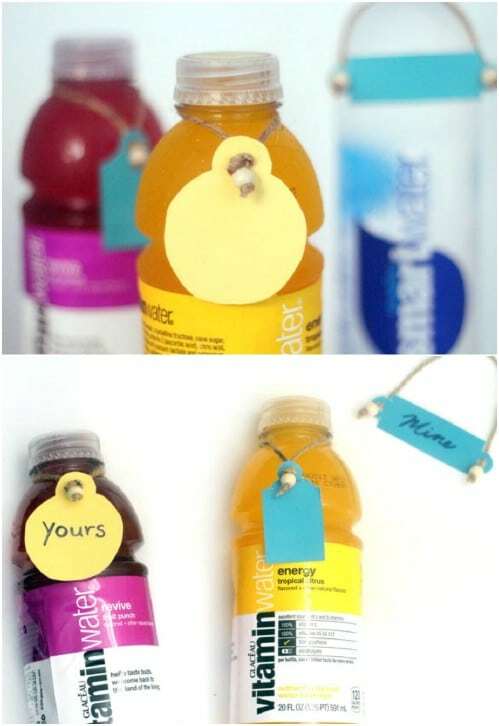 You can avoid situations like that with these cool DIY water bottle hang tags that you make with plastic beads. These are great for parties, too. You just write out the names on the tag and then they hang over the neck of the water bottle – and you can do them to fit any bottles, Gatorade, soda, etc.